I’ve told you a gazillion times how much I love All You Magazine. The only bummer is that it’s not available to you in stores. Here is a great deals on All You Magazine! For one day only, you can get All You Magazine through Ebates and get 51% Cash Back! If you haven’t signed up for Ebates yet, you’ll also get a $5 bonus just for signing up! Don’t wait on this offer. Head over to Ebates, select “Books and Magazines” and search for All You Magazine! All You is one of the best magazines out there, FULL of high value, exclusive coupons! Don’t wait for this one, it’s the lowest price I’ve ever seen! 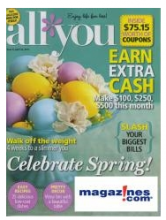 Offers Apr 11, 2011 in AllYou · Expired! All You Magazine is offering a FREE Seventh Generation Dish Liquid Sample today. The first 30,000 to request this offer will get their free sample! 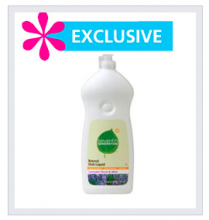 Offers Apr 6, 2011 in AllYou, free, samples · Expired! 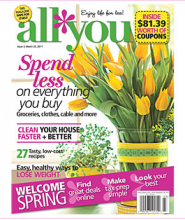 Giveaway: 2 1-year subscriptions to All You magazine! I am so excited to tell you about this giveaway. I am giving TWO lucky readers a 1 year subscription to All You magazine. This is my way of saying “Thank You” for making Frugal Day what is is today. I absolutely love All You magazine. It’s full of high value coupons and great money saving ideas. I’ve also taken advantage of the great recipes and meal planning ideas. This magazine is only available through Amazon.com and some Walmart stores. Giveaways Feb 24, 2011 in AllYou, Amazon, free · Expired! All You Magazine is offering another great freebie! Get a free sample of Tom’s of Main Toothpaste! These offers typically go fast, get yours now! Allow 6-8 weeks for delivery. Free sample: Get a free sample of a KashiÃ‚Â® TLCÃ‚Â® snack. All You Magazine is offering another great freebie! Get a free sample of a Kashi® TLC® snack. These samples go very quickly and there are limited amounts available! All You Magazine is offering another great freebie! Get a free sample of Woolite Dry Cleaner’s Secret. These samples go very quickly and there are only 10,000 available! All You Magazine is offering another great freebie! Get a free sample of Lanacane Gel. Head over to All You Magazine for your free sample! These samples go very quickly! All You Magazine is offering another great freebie! Get a couple free samples from Target! Get a free sample of Glade OdorShield Trash Bags or Tide Original with Acti-Lift laundry detergent. Head over to All You Magazine for your free sample! These samples go very quickly! Offers Oct 9, 2010 in AllYou, household · Expired! All You Magazine is offering another great freebie! Get a free sample of Garnier Fructis Shampoo! Head over to All You Magazine for your free sample! These samples go very quickly! Offers Oct 8, 2010 in AllYou, free, samples · Expired! All You Magazine is offering another great freebie! Get a free sample of Dove Daily Treatment Conditioner. Head over to All You for your sample! Offers Oct 2, 2010 in AllYou, beauty, free, samples · Expired!